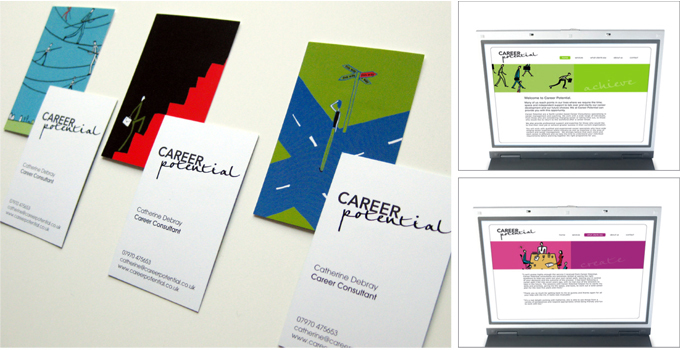 Career Potential www.careerpotential.co.uk are a London based consultancy specialising in career management and coaching. They work with a wide range of individuals, from those who are considering changing career or taking time out, to those who would like to return to the workforce after a career break. The new brand identity included a logo with ‘potential’ handwritten to reflect the individuality and talent of their clients. Illustrations were used throughout on the back of the business cards and website which conveyed the friendly approach of the company. These also tied in with key words for eg; ‘acheive’, ‘choice’, ‘succeed’. The website is clear, memorable and can be easily updated by themselves.